Hi, Roberto! What have you been working on since we last chatted with you? 2017 was a great year for me! I kept creating new designs, but I spent most of the time travelling to promote my work during Prides and events around the UK and Europe. 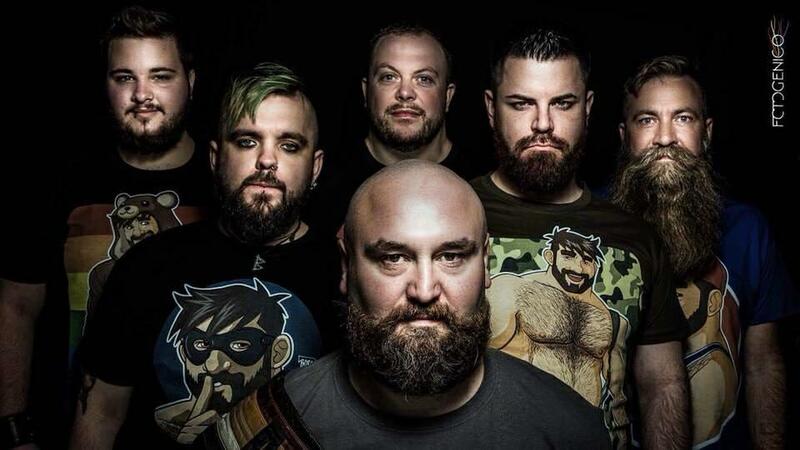 Thanks to this, I could be in Brighton, Birmingham, BearScots in Edinburgh, Sitges Bear Week, Gran Canaria Winter Pride, Mad.bear in Madrid, and Cologne Bear Pride. 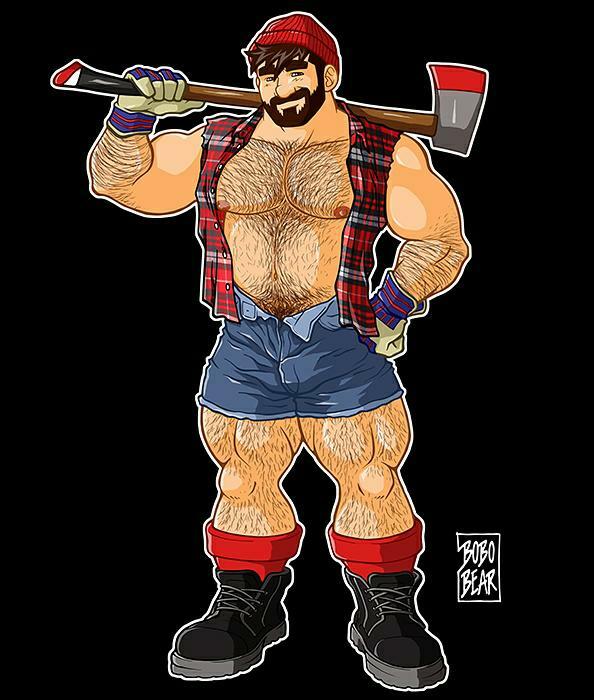 I also created the t-shirt design for the staff of the bear bar El Hombre in Paris. Oh, and you can find my t-shirts in Fort Lauderdale, Florida too! Yeah, I was quite busy! 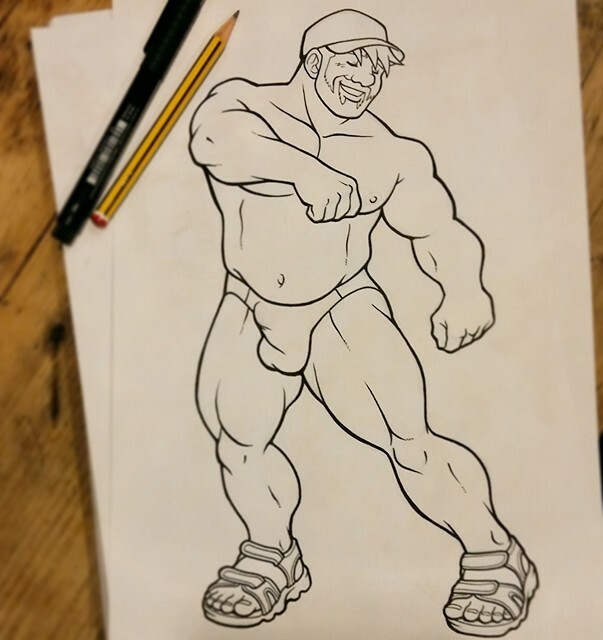 Your designs were very visible at both Brighton Bear Weekend and Brighton Pride in 2017. How were these events for you? Brighton Bear Weekend was a huge boost of confidence. I was at the beginning, and seeing posters with my designs everywhere in Brighton felt so good! At Brighton Pride, I had my first stall ever and it was incredible. I felt so much love! And I realized that you get to see many naked men – that’s why I always want them to try a t-shirt on now! I love my job! I also worked a lot – at the end of the day I was exhausted, but so happy. Do you spend much time here in Brighton? What do you like about it? I have a few friends in Brighton. Last year I couldn’t spend as much time here as I wanted to, but for me it’s the perfect place to relax. There is such a good vibe and people are so welcoming. I will definitely come here more often this year! 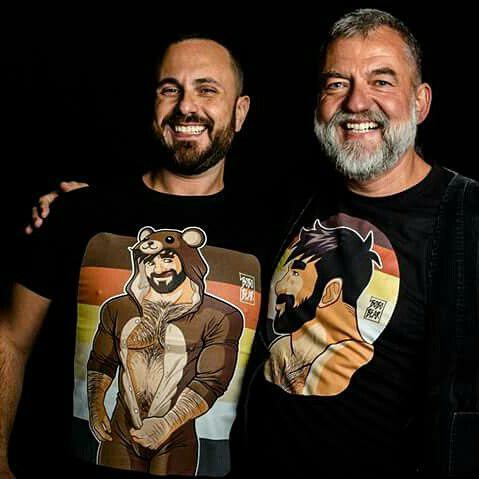 You’ll be appearing at Prowler in Brighton on Saturday 27 January to launch the fantastic new logo that you designed for this year’s Brighton Bear Weekend. What can we expect at this event? I will be there to meet all the people who like my work, answer any questions, sign cards or anything you want, and give a lot of hugs. Oh, and let’s take a shameful quantity of selfies! 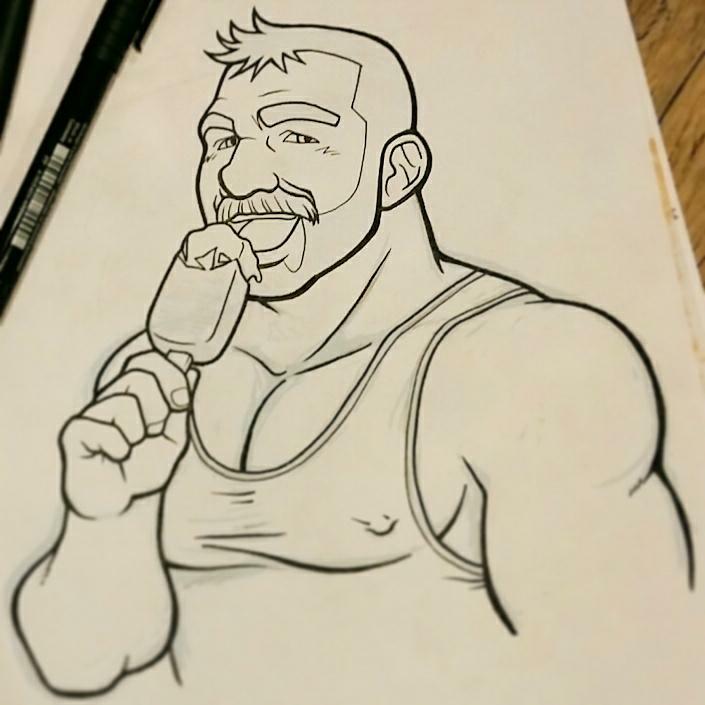 Apparently there will be some nibbles too, and the guys in Prowler are so lovely that it’s always a good reason to be there. 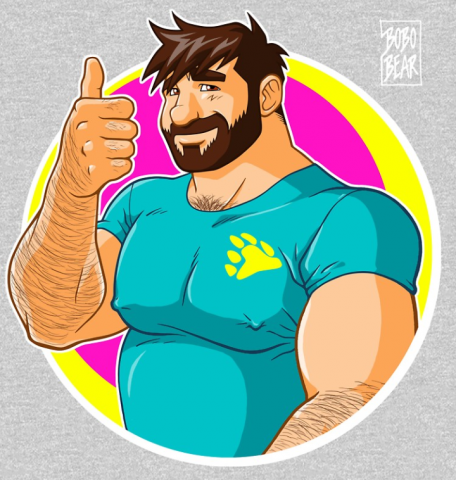 The Brighton Bear Weekend 2018 logo is getting great feedback so far! Can you tell us a little about the process of designing it? The starting point was the idea of a friendly environment for people to have fun together. What do we do when we want to have fun? We go out and have a drink with a friend! That’s why I drew two guys, a man and a bear (because it’s Bear Weekend), having a beer together and smiling with the Royal Pavilion in the background – that’s kind of traditional for Brighton Bear Weekend logos. The style is quite different from what I normally do; I wanted it to be simple and distinctive. I also have to say thank you to the Brighton Bear Weekend guys – this has been a team effort, really! Any exciting projects coming up? What will you be working on next? These days I’m working on many new designs and characters for summer, which will be out soon. This year I will travel much more – there are already so many events on my calendar! Of course Brighton Bear Weekend and Brighton Pride are part of this. I will have a stall at both, where I will present all my new stuff. 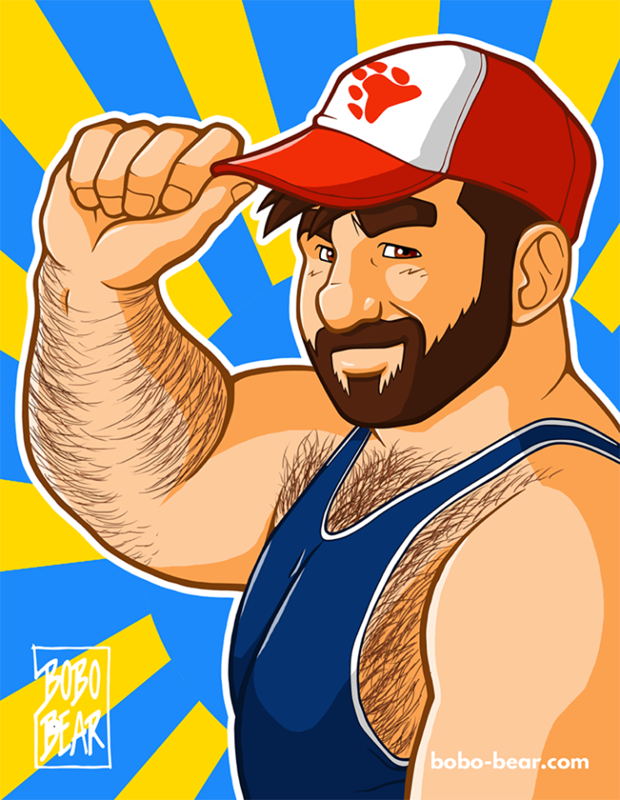 I might also go to Provincetown Bear Week in the US – that would be something big! And then … who knows? The year has just started. Many more exciting things will happen! Thanks, Roberto – we look forward to seeing you again soon! 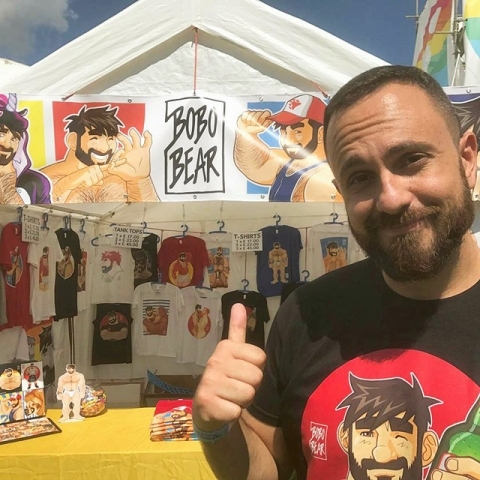 While you’re here, you can also check out Bobo-Bear’s website, Facebook page, Twitter, Instagram, and online shop.